The Florida Forest Service has long employed the Fire Prevention Program featuring Smokey Bear, the Firewise Communities Program educating homeowners and community members about creating defensible space around their homes and Prescribed Fire to increase protection for people, wildlife and property. 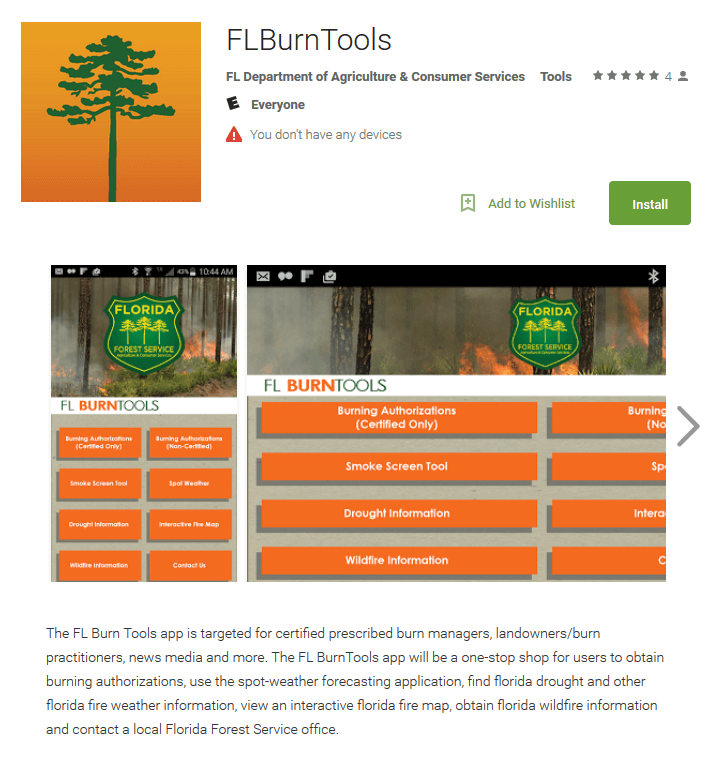 The agency has reinforced its fire prevention and management toolbelt with an app called “FLBurnTools.” This app isn’t just for foresters; it also contains features designed for homeowners. The “FLBurnTools” app provides drought information, interactive fire maps, wildfire information, burning authorization requests, smoke dispersion models and spot weather forecasts. Download the “FLBurnTools” app free on the App Store and on Google Play. According to the Florida Department of Agriculture and Consumer Services more than 2,100 wildfires burned 53,476 acres in Florida last year. For more information on the FLBurnTools app, click here.